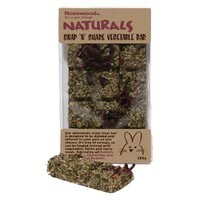 Rosewood Naturals Snap 'N' Share Vegetable Bar is a 100% natural, deliciously crisp treat bar, loved by rabbits, chinchillas, degus, guinea pigs and other small rodents. Free from cereals and other unnecessary bulking ingredients; these yummy bars are instead enriched with healthy vegetables, seeds and herbs. They are designed especially to be divided up and offered to your pet as you wish. My 2 bunnies love the snap & share bars , they run to me as soon as I have the packet . They always get excited with this treat . Brought this for my bunnies 5th birthday, he shared it with his siblings and piggy friend and they all loved it! My rabbits really enjoy this as an occasional treat. I trust the rosewood brand to be safe to feed to them.